As Guyana celebrated its 48th Republic Anniversary in its glory and colorfulness, the Guyana Judo Association hosted its first Major Judo Grand Slam for 2018 at the impressive Muslim Youth Organization’s Tarmac in Woolford Avenue which coincided with the Republic celebrations across Guyana. 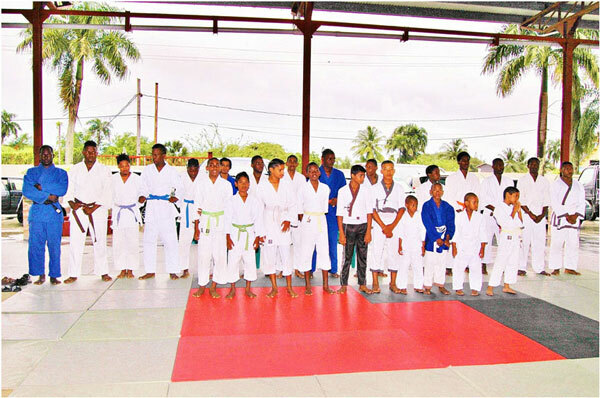 Successful students of the Guyana Judo Association 2018 Republic Grand slam. Joshua Buchanan and Erskine Trotman, who represented Guyana at International Tournaments, also competed fiercely to earn a place for their upcoming overseas assignments. The event featured athletes from four clubs in Georgetown and one on the Western Bank of Demerara. The Tournament closed with the President, referees, and executives of the Guyana Judo Association congratulating all the athletes competing in the tournament. The most outstanding award went to Abdullah Eastman who was judged at the best overall fighter, while the best technique went to Ishmael Allicock of D’Urban Street Dojo. The association would like to thank Trophy Stall for their sponsorship, Bettencourt’s Foods Inc of D’Urban Street, Fazal Nazeem Grocery of Independence Boulevard, the Muslim Youth Organization, ISA Islamic School, Modern Grafix of Anandale ECD, Barkos Financial and Optimum Communications Inc, both of D’Urban Street Wortmanville.